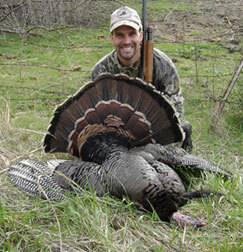 Spring turkey season with Mid-America Hunting Association and other impacts. Spring season opening week. Last year’s crop fields not yet worked up to plant. What most like about our spring turkey season is availability of our private lease land in two states having liberal OTC spring turkey season tags. But, mostly our land is prime, its good turkey hunting which attracts hunters. 100% private land we lease for our exclusive use. We lease habitat of predominate wildlife within any particular region of each state where we do lease land. In this case we are talking about some of the best spring wild turkey land to be found in Missouri, Iowa, Kansas. When looking over our lease land location maps it readily becomes apparent we have acreage concentrated in several regions while ignoring others. Difference is recognizing terrain variance along with cover/food habitat . In Missouri, we pretty much stay out of the Ozark Mountains due to far too much wooded ground, too little farm ground. Significant’s is when it comes to nature and turkeys food is what makes more turkey. Then reproduction second. In agricultural zones where 50 to 55% of land use is farmed turkeys have plenty of food. Their cover and roost needs are also well provided with numerous tree lined creek bottoms as well as the timbered ridges separating the river valleys. One aspect many big woods turkey hunters find most challenging first, then gratifying later is eyes-on scouting/hunts rather than call/listen techniques. While big woods hunter will frequently hear his toms far more often over longer periods than see them. In our country the converse is more frequent with our large farm fields. A story we frequently hear each season from such big woods hunters on their first central mid-west hunt is that which most impresses them with their hunts. That is length of time they were able to watch their tom come into decoy or call. Hunt accounts tell of how agonizingly slow toms would come in. How toms would hang up just out of range. Or, how exciting it was to watch what a tom does when he is working a setup or call. 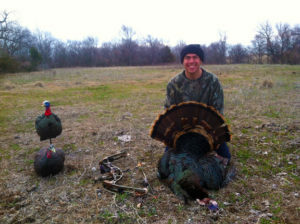 One of many fine do it yourself MAHA spring turkey season hunters who send in their pictures. Stubble is last year’s soybeans. Greens are early weeds/grass. In terms of our spring turkey season flocks will be working previous year’s row crop fields as readily as grazing on quick to green up, weeds, wheat or alfalfa. In Kansas, better regions are in watersheds as opposed to higher ground called Sand, Flint, Smoky Hills etc. Hills, as best as Kansas a prairie state can produce which are far less in height than elsewhere. The difference between the watersheds and hills is soil composition, depth. When the glaciers came through our Great Plains they scalped high ground clean of soil depositing soil into watersheds making crop capable land. Or, where due to food better turkey populations are found. Food is within watersheds where Kansas has row crop farms. In hill country where soil is thin allowing only cattle pasture, or little food, little turkey nesting cover. Significant’s to spring turkey season is where there is row crop there is food, where there is better soil there is cover habitat to include stands of roost trees with tall grass prairie allowing nesting. 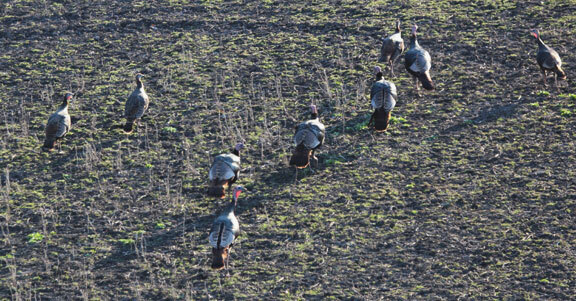 A good combination of turkey habitat within a small area making a region of better turkey hunting. 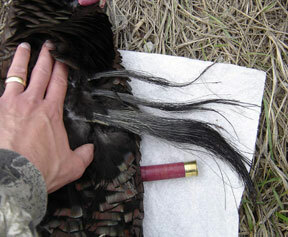 Especially inclusive of nesting cover making better spring turkey season hunts. That one aspect alone of knowing where to hunt takes away much mystery for traveling hunters. We have such a vested interest as we are a paid hunt operation which requires return hunters to survive as a business. To get return hunters requires good days in field over many days. Good wild turkey hunting both fall and spring season. This money approach does not lessen anyone’s experience, it assures a good experience. A difference between a business approach and a good ol’ boys hunt’n club. Proud to show Klint’s son’s first bow harvest. Nesting habitat along with food supply makes season to season residential flocks. Without both sustainability of any flock is jeopardized. However, nesting cover anchors day long flock behavior. Roost trees are a secondary concern. Flocks will make best use of what is available in terms of roost trees. As long as there is food and nesting cover. Focusing on nesting cover gives hunters advantage of flock direction of travel from flydown, feed, water, to nest all the more so as egg laying increases. Selecting where to go for spring turkey season is first to select between one species of two we offer. We have both Eastern and Rio Grande to chose from or hunt both, doing so on one trip if wanted. After selecting the species then comes options of where in each states we lease land of where to hunt. Choices cover a good bit of ground. Rios in central to western Kansas with Easterns in eastern Kansas, all of Missouri up to Iowa. But, habitat throws folks, especially spring turkey season hunters. We are beating a dead horse on this one. Doing so because recurring spring season experience tells us we need to. A challenge most spring turkey season hunters face is they are accustomed to finding birds in large stands of trees. This expectation frequently follows hunters when traveling to our Great Plains to hunt. Forgetting what it means to be on the Great Plains. Great Plains means a lot of efficient agriculture on flat land with a roll to it. Large tree stands are non-existent. At least those stands compare to Minnesota, New York, Alabama, Florida, etc. At this point hunters are going to have to trust us that we will get them on wild birds. That trust is not based on these words. It comes from understanding we seek our hunters to renew their membership every year over seasons to come. That happens, it happens a lot. Reason folks return is good hunts. Good hunts happen when big woods folks change techniques to accommodate the open land flocks occupy. That is no small point as easy as it may be to write or read such words. Trust us when we recommend where to hunt that it is a good spot. That trust is recognition of our motivation for membership renewal over all else.